In between watching the trunk of a sago palm be transformed into flour, sampling kinilaw (Philippine 'ceviche') at the fish market, and learning how sap of the nipa palm's flower stalk becomes vinegar (and liquor), we looked on as a Butuan native made a few of her favorite dishes. 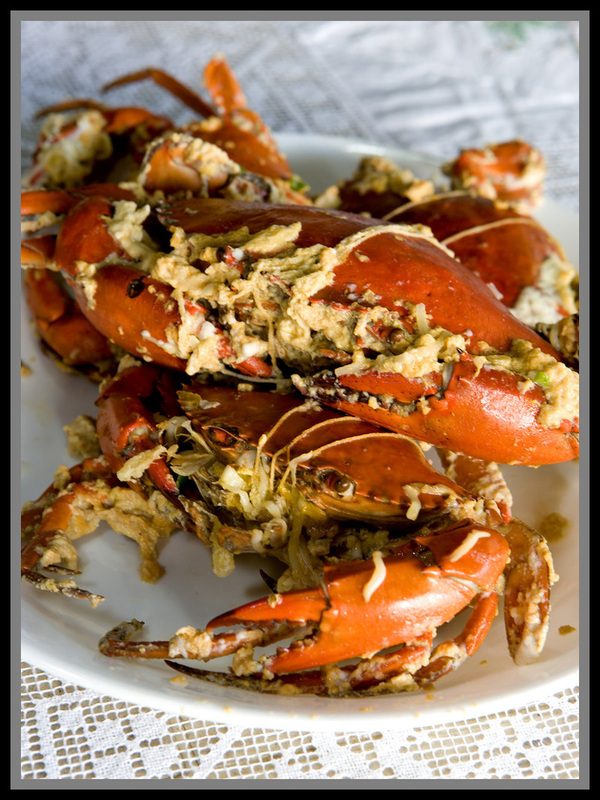 Our favorite of her favorites would have to be Buntaa Binuntaan, crabs stuffed with fresh coconut and their own fat and cooked in coconut milk. Despite the fact that coconut oil is now deemed healthy, this dish is clearly over the top - lusher than lush and not something you'd eat every day. It's also the sort of dish that I can't imagine anyone, other than those with a serious aversion to coconut milk, not loving. And it's surprisingly easy to make, assuming you have access to a key ingredient: buko or young coconut, still soft enough to be scraped from it's shell in silky strands (which you probably do; I saw them for sale at a Whole Foods grocery store in Santa Fe, New Mexico and they can be found at many stores specializing in Southeast Asian ingredients). Our hostess, the same lovely woman who hooked us up with the sago makers, learned this recipe from her mother and great grandmother. She started with about two and three quarter kilos of fresh crabs. Female crabs are what you want for this dish, because their roe is a key component (how do you tell a female from a male crab? Flip them over and compare the size of the 'flap' that covers the bottom half of their bodies; the female's 'flap' is wider). She put the crabs in the freezer for a few hours, until they were 'asleep' and immobile, and then pulled off their top shells. she carefully removed fat and roe and from both halves and set it aside. It would be mixed with the shredded buko. To this mixture she added a generous amount of garlic - pounded in a mortar, not chopped - chopped ginger, thinly sliced scallions (both white and green parts), chopped red onion, and salt. 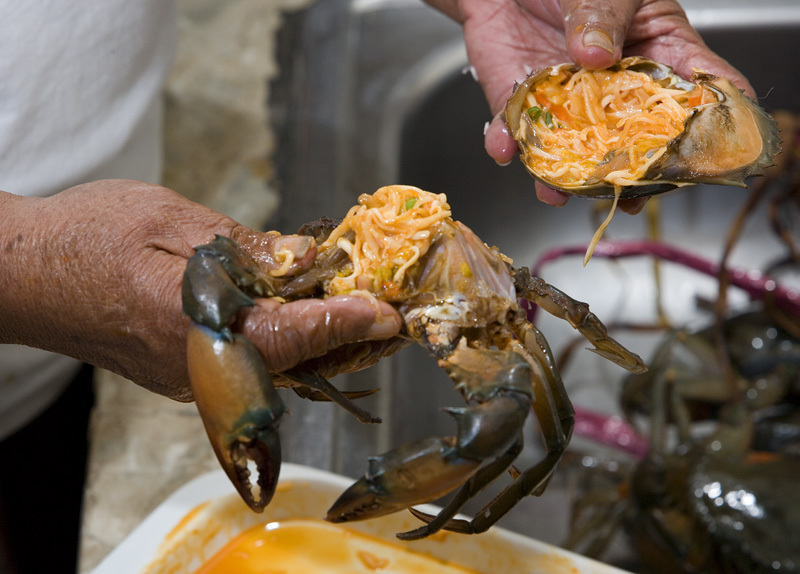 She carefully cleaned the empty crab shell tops and stuffed them with the mixture. 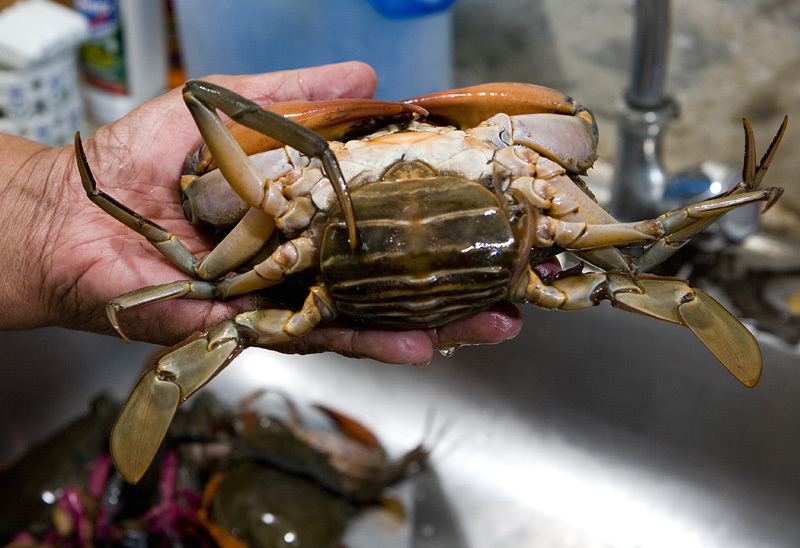 More stuffing went into the cavities of the crab bodies created when their gills and fat and roe were removed. and tied the halves together with kitchen string. The liquid that remained on the platter after the crabs were stuffed was set aside for later. The crabs went into a deep casserole, along with a good amount of crushed fresh ginger. Probably the most laborious part of this recipe is squeezing the coconut milk (assuming it doesn't come out of a can). My favored method for extracting coconut milk involves hot water, an electric blender, and cheesecloth, but in this Butuan household it's all done with manpower - two 'pressings', the first for coconut cream and the second for the thinner coconut milk. 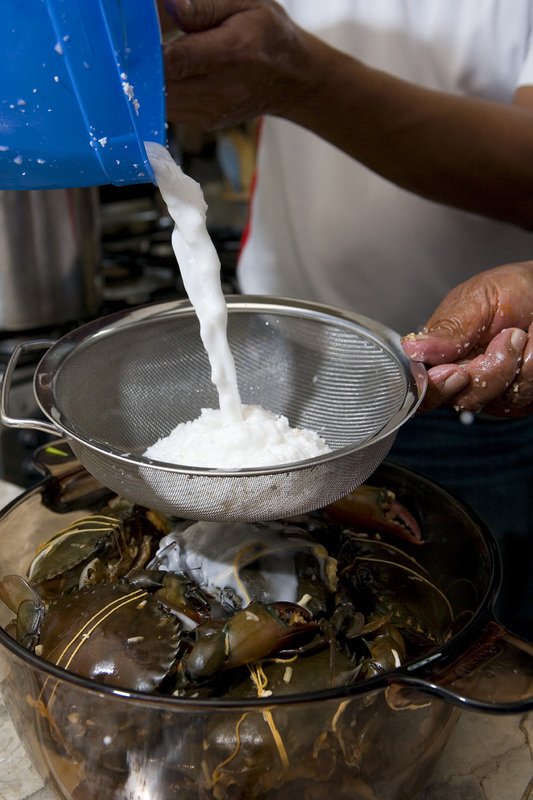 After placing the crabs in the pot our host added thin coconut milk to cover them by about two thirds. There was some coconut-crab mixture leftover after the crabs were filled; this she wrapped in tin foil (you could use a banana leaf) and placed in the pot as well. After bringing the coconut milk to a boil she covered the pot and left it to simmer steadily for about twenty minutes. 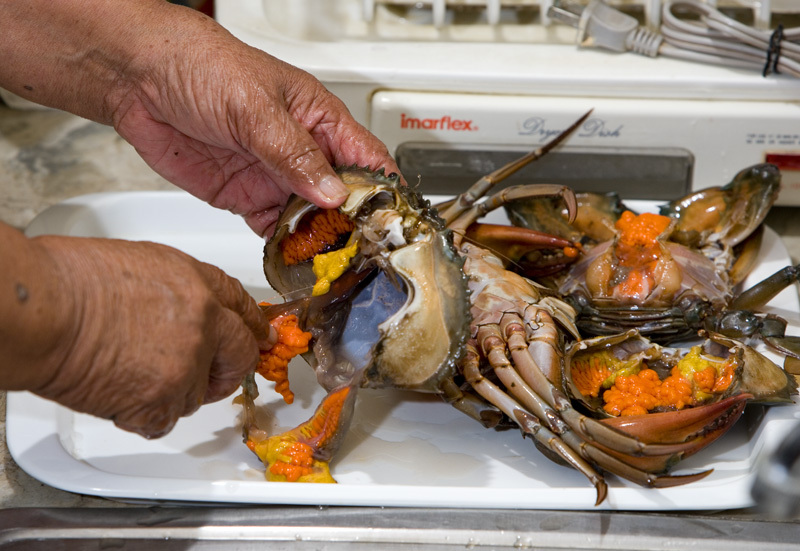 As soon as the shells of the crabs turned red red she added the coconut cream and the coconut-crab fat juices that had drained from the filling mixture and muddled the liquid in the pot a bit to mix. Once the liquid came to a boil again the dish was finished. 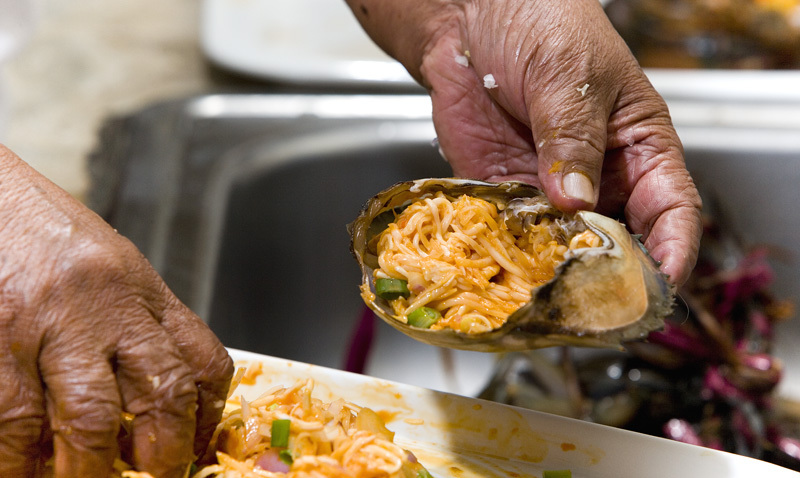 The kitchen had filled with the heady aroma of good, spanking fresh seafood, peppery ginger, and coconut oil. The crabs came out of the casserole with bits of congealed coconut cream clinging to their shells, and there was plenty of coconut milk sauce to spoon over rice. I know that a number of other dishes were placed on the table that evening, but for the life of me I can't remember a single one. I passed the evening in a delirium, a crab and coconut milk-induced fog. I'm not including amounts because (1) I didn't do any measuring while our hostess prepared this dish and (2) this is very much a to-your-taste sort of food - if you hate ginger, omit it. If you love garlic, add lots. If you don't have red onions on hand, add more scallions. Just be sure you've got female crabs, that they're big enough to make prying apart, cleaning, and stuffing worth your effort, and that you've enough coconut milk and cream (if you're using canned consider thinning some with water to substitute for the second pressing coconut milk) on hand (a good way to guesstimate is to determine the capacity of the pot you'll use and then figure on at least half that amount in coconut milk). Put the crabs in the freezer for an hour or two, until they completely stop moving. 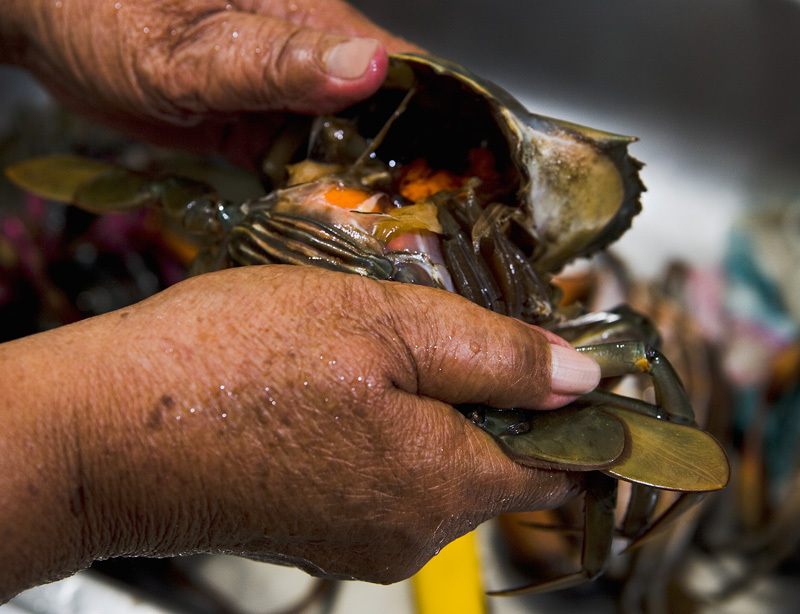 Working quickly, pull the top shells off of the crabs, discard the inedible gook clinging to the inside of the shelll, and carefully scrape into a bowl all crab row and fat. 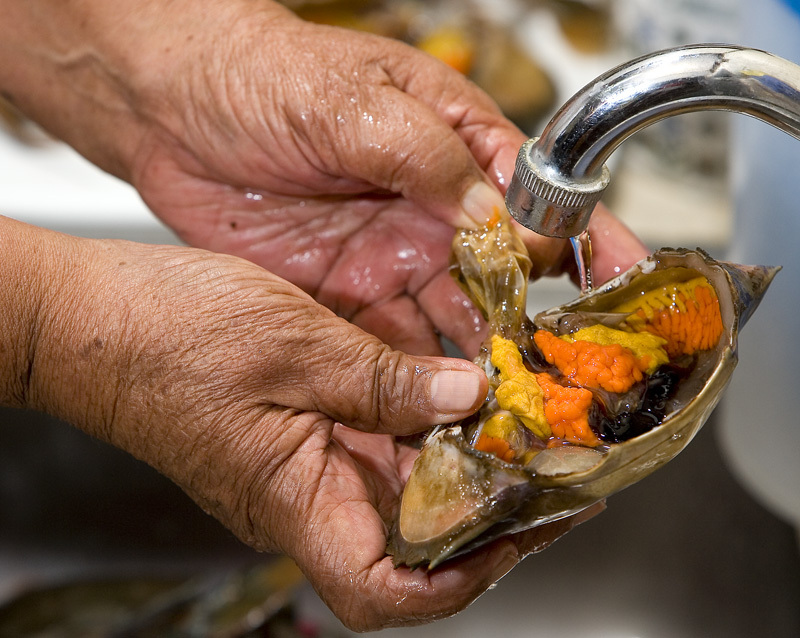 Clean the crabs and their now-empty top shells under running water and set aside. 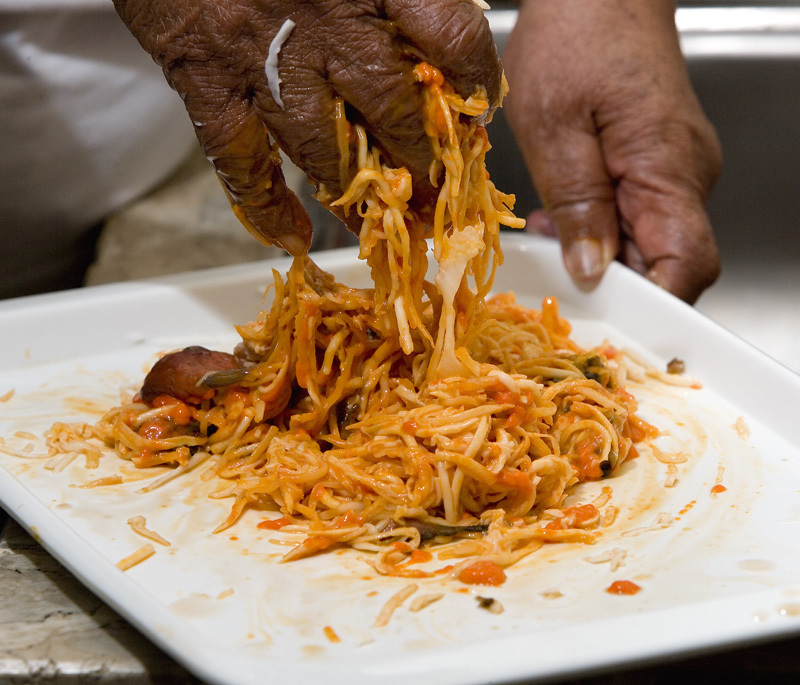 Using your hands or a fork. 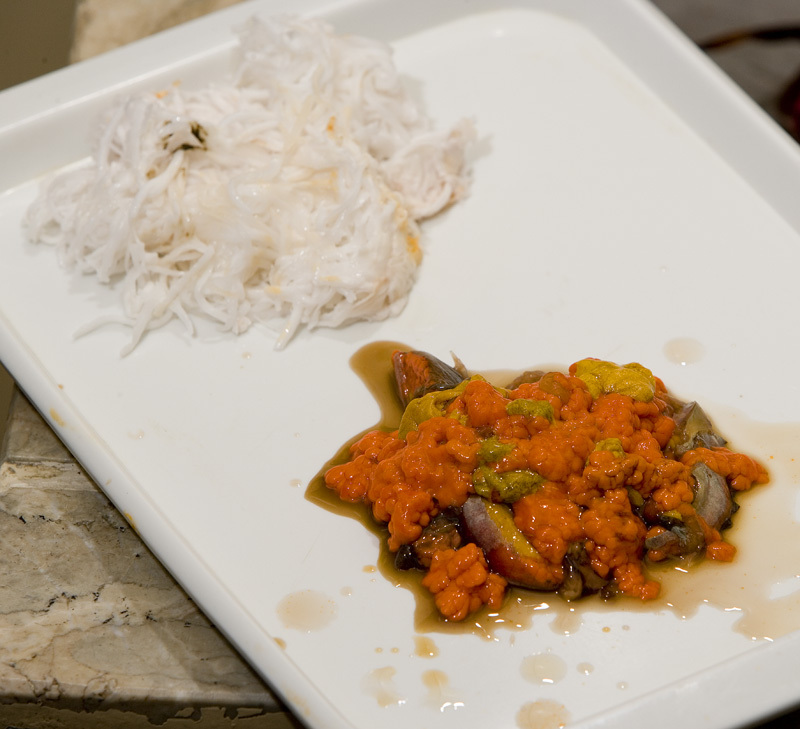 mix the shredded coconut with the crab roe and fat, the green onions, garlic, red onion, salt to taste, and the chopped ginger. 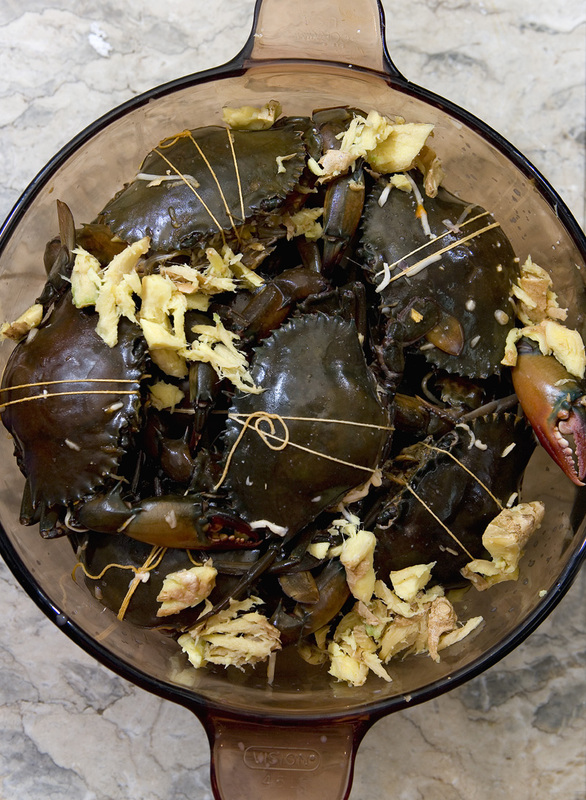 Fill each crab shell and body with the coconut-crab roe mixture, then reassemble the crabs and tie them together with kitchen string. Wrap any leftover filling in tin foil or a banana leaf to make a flattish packet. Set any liquid aside. 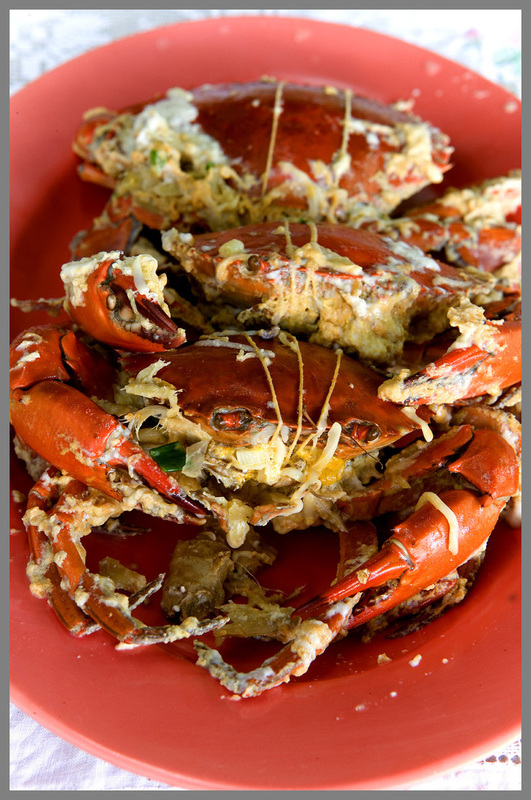 Lay the crabs on top of each other in a deep casserole (use an appropriately-sized casserole; the crabs should be in at least two layers) and add thin coconut milk to cover them by about two thirds. Scatter crushed/pounded garlic on top of the crabs. 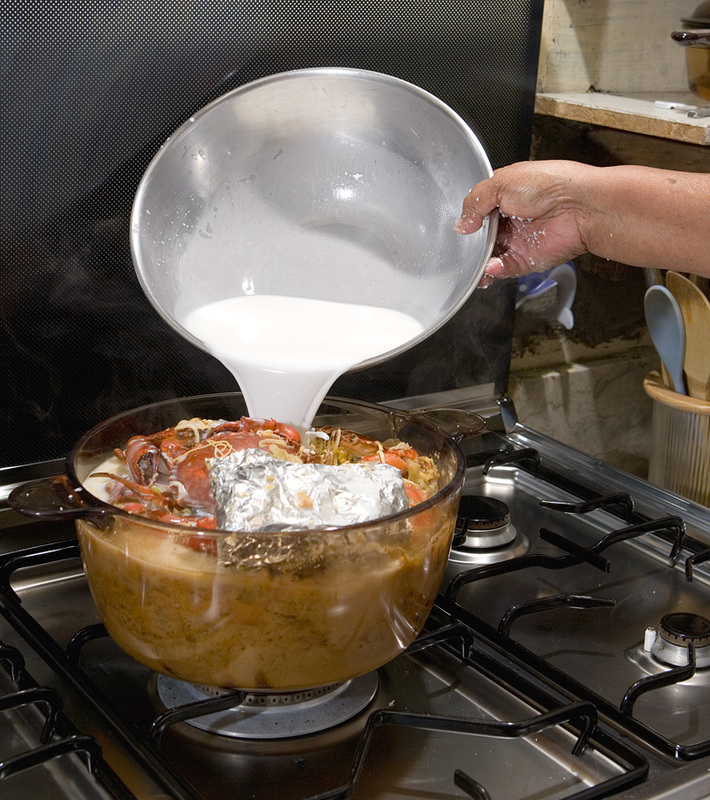 Bring the mixture to a boil, then reduce the heat to a brisk simmer and cover the casserole. Check the crab's progress occasionally. 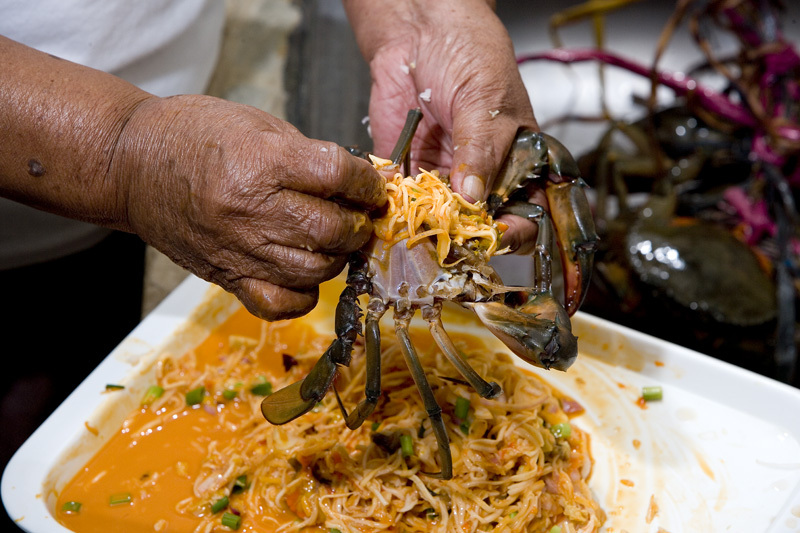 As soon as the crabs turn pink pour in coconut cream and leftover filling 'juice'. Stir quickly just to mix, bring the liquid to a boil again, and then remove the casserole from the heat. Serve hot or warm, with lots of rice. Susan - Doesn't it? I've just made myself very hungry and I'm really wishing there was an evening market nearby where I could pick up a few crabs for dinner! Good lord - that looks fabulous. Nothing better than fresh crab. Thanks for the post and excellent photography. 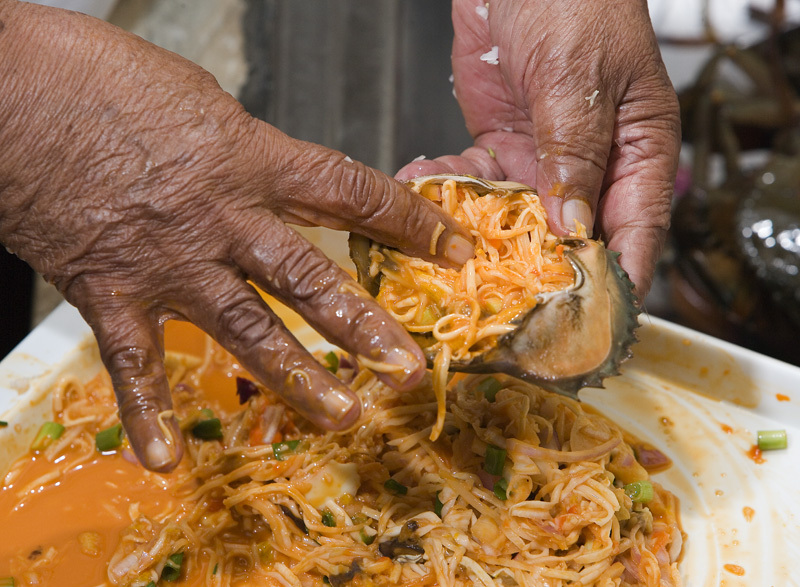 The coconut squeezing picture really reminds me of our kitchen back home -- nothing ever came out of a can. Good God Almighty, this beats the hell out of Singapore Chilli Crab. What a fabulous recipe, and how lucky you were to see it being put together and then eating it!! Fantastic photos - esp the coconut milk ones! I just had dinner but I'm still salivating...especially looking at the picture of the crab roe. Robyn and Dave, your photo and food essay on Butuan has made me decide to plan my trip there this August. I don't know if it's further synchronicity but there's a gold exhibit here at a local museum that has a display of gold pieces discovered in several archeological digs in Butuan and Northeastern Mindanao. But I'm going to track down that kilawin vendor for sure!! Thanks. Robyn, this looks truly glorious, and with the temperature climbing in New York, like one of the few things I'm eager to turn the gas on for in my kitchen. 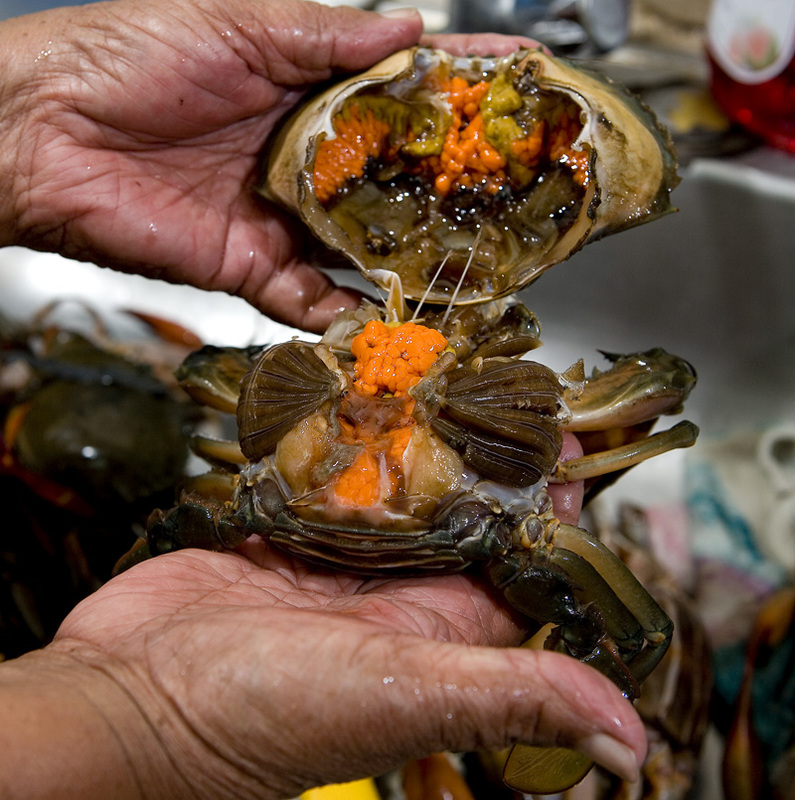 I have a stupid question though--do all female crabs have roe? Or is it sort of a cra(b) shoot? Lizzie, I agree ... although a nice big lobster or some jumbo prawns can give crab a run for it's money. Jude - betw. you and me I'd really have to be desperate to used canned coco milk. Squeezing it fresh is not that hard at all, either. Mila - that's great. Do drop us a line and let us know how the kinilaw was. Rohan, I believe that all female crabs have eggs, but in varying amounts. A good fish monger should be able to advise you on which types would have the most (maybe the time of year is important, on the east coast?). Good luck with the recipe! man powered coconut milk.. got to love it... gnarled hands and all.. lol. Cool blog! Xander - it's a darned good dish! I've been surprised by the fervency of the comments on this post. 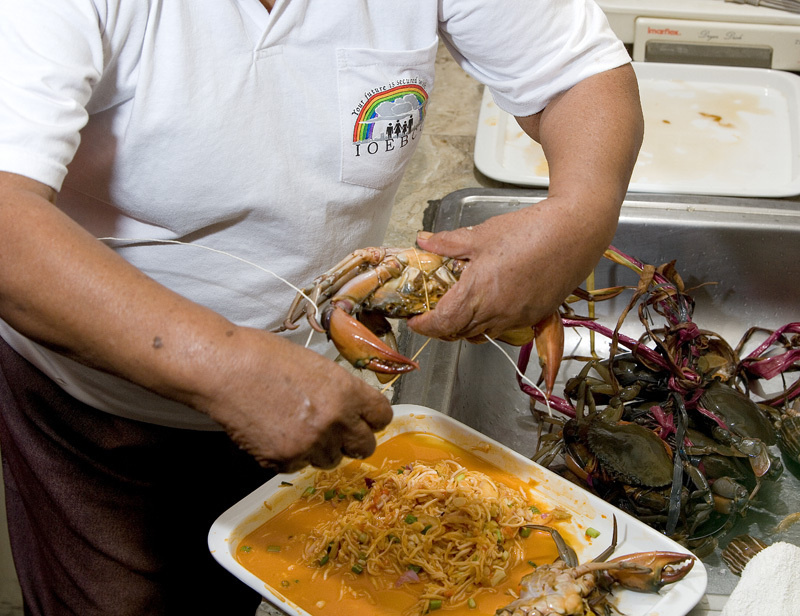 Put it down to the universal appeal of crabs and coconut milk, I guess. Oh. My. Gosh. That looks amazing. I'd be in a delirium too if I were in your seat. many thanks on your post on butuan's national dish (sort of). it's actually called either buntaa OR binuntaan. my mother's sister eleanor does a simplified version which is about as authentic as we'll get outside butuan. all ingredients are the same, except she doesn't stuff the crabs. similar to the ulang prawns in coconut milk we had in arayat. except the pampangos use scallions and ginger very sparingly while the butuanons use it a lot. nobody does it quite like may aunt virginia villanueva in butuan city though. Just the way my mother used to cook Buntaa. I really tried buntaa myself but i would say, my mom's way still the best. Renato, when in Manila visit Ayala Museum at Greenbelt, Makati and Metropolitan Museum at the Central Bank compound, Roxas Boulevard for the permanent display of fantastic gold ornaments. Butuan has archeological evidences that a number of gold finds and devices for gold processing were discovered in Butuan. It's an all-Filipino dish "to die for"; make no mistake, it's not a health food, it's high in cholesterol (roe and coconut milk). But what the heck - at least you die happy! My mom cooks it the best of course, she prepares it almost everytime when I visit her in L.A.! Wow what a great post, sorry I missed it when it was first posted thanks for the refreshed link! May we know your host there in Pampanga? Are they the best people to get in touch with regarding good food in the Philippines? My, your post really is enticing - thanks! I'm gonna pause now because I'm getting hungry. Hmmm, I wish our ref has fresh crabs inside.